Well, the feedback for our whipped-together snow day dinner last night was overwhelming. Thanks… You know, it makes a semi-stay-at-home feel pretty good about the time investment she makes on Pinterest and staring at her pantry, uninspired. It also kinda boosts my ego for my efforts in the kitchen. And, since I actually consumed this meal, I can tell you–it was damn good, too. So, here’s the disclaimer for my “recipes:” First off, I have to put it in quotes, because I don’t have an exact measurement of anything for you, unless I used a “whole can” of something, or literally dusted off our measuring cups to exact something out. Cooking (for me) is way more about getting creative with food, letting go of the routine of the everyday and just kinda seeing what you can come up with when the most effort you’re putting in is keeping your wine glass filled up. Secondly, they’re inspired by something I read about, saw in Pinterest or put together using supercook.com (A fabulous place to get ideas when you feel like all you’ve got left is random ingredients). I have a hard time staying focused on a recipe page (unless it’s Easy Italian by Betty Crocker), or keeping my phone on a link. Greasy finger don’t pan out well for an iPhone screen. Third, I have favorite knives, a favorite cutting board and favorite cookware that I’d rather use in any occasion, so it’s not always in line with what the pro suggests. What to Do | Marinate the shrimp in EVOO, Lemon Pepper, Minced Garlic and Oregano. Use as much as you like, but the goal is to get the shrimp good and smothered. I put them in the fridge after breakfast and gave it a good stir every few hours. Make sure they’re thawed out before you cook them, if you used frozen. Cook grits according to the package. As soon as they’ve soaked up all of the water, slowly stir in your cheese and pimentos. Make sure you turn it down to seriously Low heat at this point. Add salt and pepper to taste. Add shrimp to the veggies and stir, toss until the shrimp and good and pink and the brussels have a nice char to them. The end! 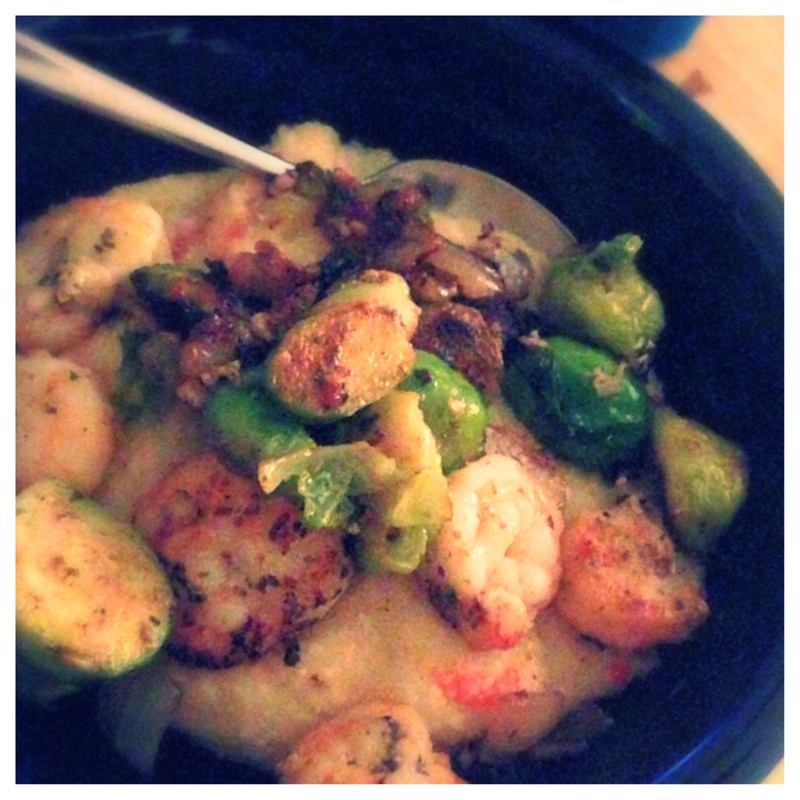 Put grits in your bowl, top with shrimp mix and try not to drool on your way to the table. We paired it with an ice-cold beer, so, you know, take that for what you will. Let me know if you guys have questions – but most of all, enjoy!